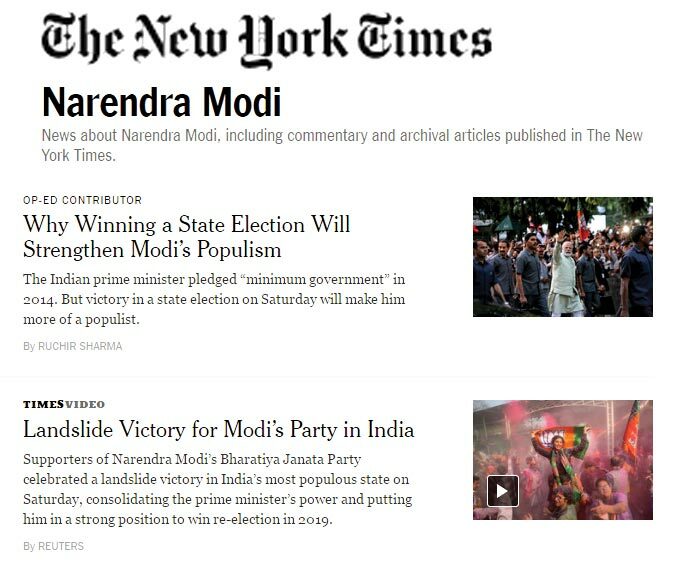 Foreign media across the globe has reported the thumping victory in Assembly polls and hailed the leadership of Prime Minister Shri Narendra Modi. 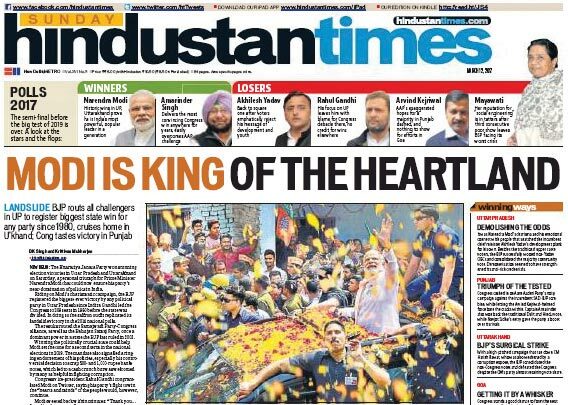 The BJP decimated every other political party in Uttar Pradesh and bagged a whopping 325 seats in the state and the front-pages of most newspapers echoed exactly the same sentiment. PM Shri Narendra Modi, according to most editorials and political commentators, is responsible for BJP’s clean sweep in the state. 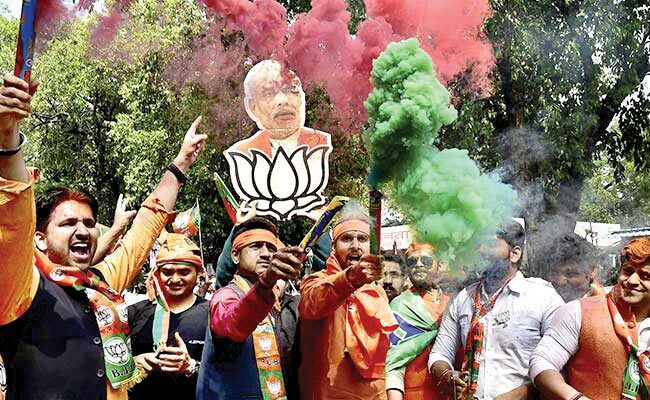 The BJP had a finger in each electoral pie — caste, religion, development…. Explaining the Indira Gandhi connection, it added: “After transforming from the Hindu Hriday Samrat of Gujarat to Development Man in 2014, UP 2017 saw Modi again re-invent himself as a pro-poor welfarist. “A combination of factors that included a pro-poor Modi , meticulously crafted caste arithmetic in ticket distribution, a division of anti-BJP votes among the SP-Congress alliance and the BSP, tremendous hard work put in by the Shah-led army of party workers for several months before the elections helped the party achieve its unprecedented win”. 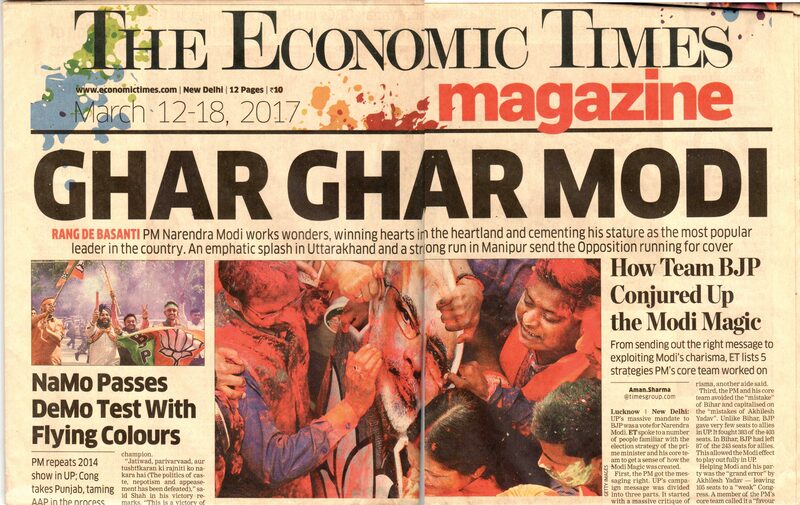 The BJP rode the ‘Modi wave’ to claim victories not just in Uttar Pradesh, but in Goa and Uttarakhand as well. After the BJP’s impressive performance in the assembly elections, Prime Minister Shri Narendra Modi has received felicitations from prominent personalities and foreign leaders including the Crown Prince of Abu Dhabi and French President Francois Hollande. Francois Hollande called up Prime Minister Shri Narendra Modi to congratulate him over BJP’s good showing at the recently held Assembly polls. “French President, HE Mr. @fhollande called PM @narendramodi to convey his felicitations at the election results. @Elysee”. 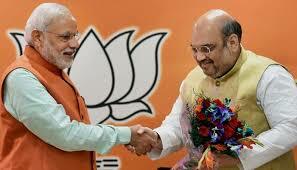 “Congratulations to @narendramodi and @BJP4India on decisive victories in UP and state elections! Courageous leadership, endorsed by Indians,” Harper said in his tweet. Shri Modi also thanked former Canadian Prime Minister Stephen Harper for his wishes. “Gratitude for the good wishes,” the prime minister responded. “Namaskar. Aadarniya @narendramodi ji, @AmitShah ji aur BJP ke sabhi karyakartao’n ko is shaandaar jeet ki bahut badhaai”. Congratulations to @narendramodi Ji & @AmitShah Ji for the mega victory. Indian democracy is coming out of the trap of caste and religion. Narendra Modi added, Thank you. People are voting for development. “More than my understanding, it is the people who have trusted the BJP & we will never betray this faith,” Shri Modi replied to Sachin Bansal. Modiji’s unquestioned leadership, strong decision making and personal charisma combined with Amit Shahji’s planned strategy have contributed to victory. When I went on the campaign trail, thousands came to the meetings — there was a total Modi surge, demand for ‘vikaas’ everywhere and hope that only BJP can deliver. The imminent victory triggered widespread celebrations all across Uttar Pradesh, in other states of the country and as well as at the BJP headquarters in New Delhi. 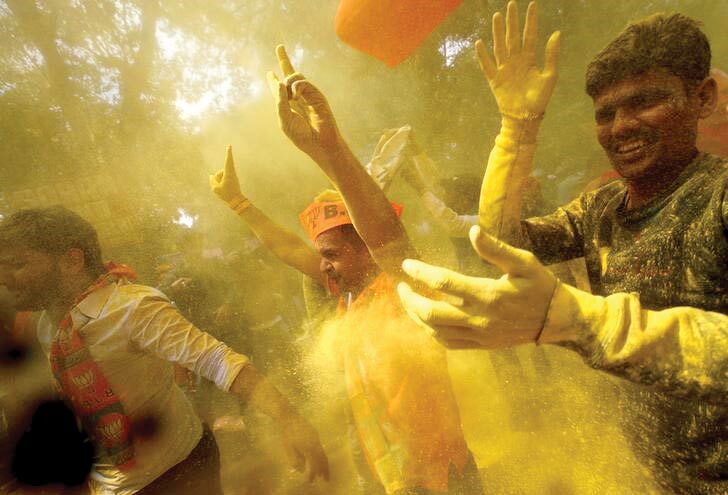 Immediately after the trends indicated huge victory, celebrations erupted outside BJP offices in every state and BJP Central Office in New Delhi with party workers dancing and splashing each other with Gulal and flowers. 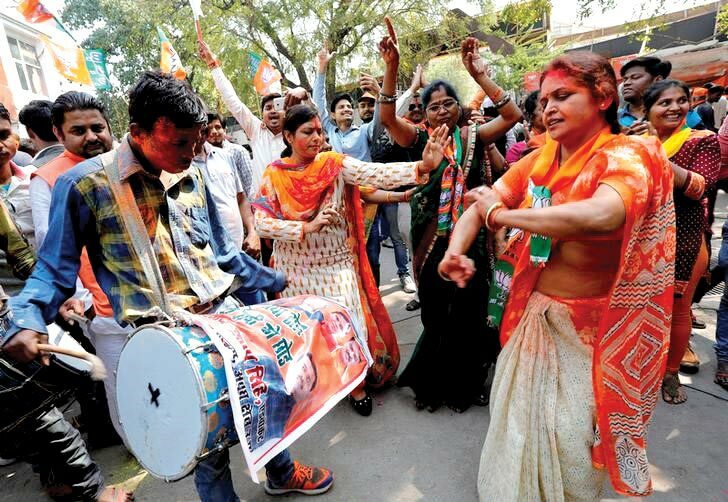 Overjoyed BJP workers, leaders and supporters hugged each other and raised victory slogans in the BJP office as counting trends indicated a comfortable victory for the party in the crucial Uttar Pradesh assembly elections. In UP the Bharatiya Janata Party office is just across the road of the sprawling Vidhan Sabha building. In that entire Vidhan Sabha area the BJP Karyakartas celebrated and raised slogans there, like “Chappa Chappa Bhajpa”, “Kahan pade ho chakkar mein, koi nahin hai takkar mein” and “Modi Modi”. Some were also carrying posters of Prime Minister Shri Narendra Modi, who most feel acted as the game changer in BJP. Addressing BJP Karyakartas at the party headquarters in New Delhi, PM Shri Narendra Modi said the election results in five states are a mandate for the foundation of a new India where the poor get opportunities, rather than dole, and lighten the burden of the middle class. PM said the BJP must make all efforts to meet expectations. He reminded the party, that its leaders depended on hard work and not legacies to rise in politics. “Ek naye Hindustan ke darshan ho rahe hain mujhe. (I can see the vision of a new India),” Shri Modi said, adding that BJP’s big success in UP, with the large population and size, could help set the country in a new direction. “The five states are the foundation of a new India. The poor are saying they will rather work than receive. Give me the opportunity, I will work hard, they are saying,” the PM said. Shri Modi also praised BJP National President Shri Amit Shah, saying equal credit should go to him and party cadres for BJP’s success. 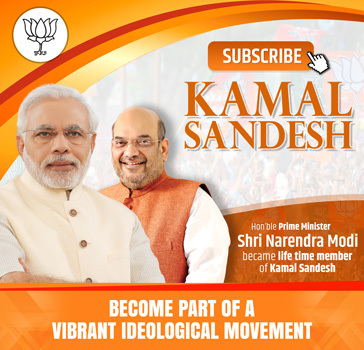 “Under Amitbhai, the party has not only won polls but has grown by leaps and bounds, spreading across the country and we can proudly claim to be part of the largest party in the world,” he said. Shri Modi said the BJP government would take everyone along as “in democracy, governments are formed with a majority but run with consensus”. The PM asked the party to be humble in victory, a conciliatory message to the opposition after a bitter campaign and ahead of a Parliament session where the Centre hopes to pass the GST law. Fruits make a tree stoop, nature inspires us that when the fruits of victory are in sight, we should stoop the most. We should not lust for office, he said. Referring to the record turnout in the five states, the PM asked political pundits to change the discourse. “Political pundits should review how the party won with an overwhelming majority after a record turnout. I have seen a few experts discussing the verdict but they should change the discourse as how record turnout happened without an emotional issue in play,” he said. He said the poor had come out of a mindset where they looked up to a patron or benefactor, an apparent reference to “mai-baap” politics he has often accused Congress of. 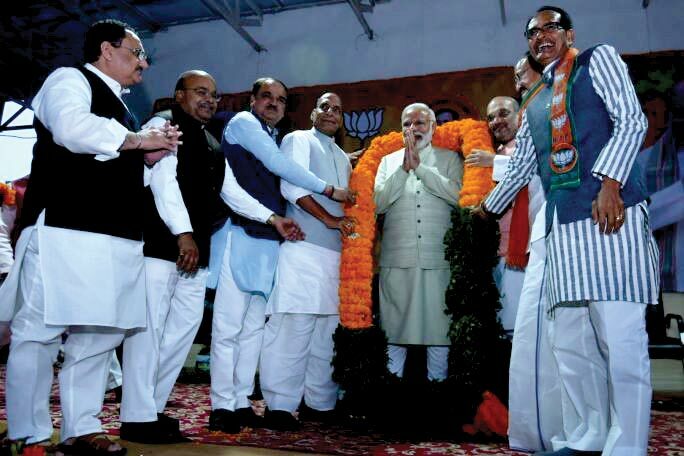 Shri Modi said BJP saw the mandate it had received as a “sacred direction” from the people to serve. “Work relentlessly to fulfill the aspirations of the janta janardhan,” he said. BJP National President Shri Amit Shah while welcoming PM Shri Narendra Modi Ji at Party Headquarters in New Delhi and addressing the Karyakartas during victory celebrations after the party’s massive sweep in Uttar Pradesh and other states said election results prove that Prime Minister Narendra Modi is the most popular leader since Independence. “The outcome has shown the faith the poor have reposed in Modi Ji. Even his political rivals will have to admit that he has emerged as the tallest leader in the country since independence,” he said. “This is a win for people, for their determination. This is a win for Prime Minister Narendra Modi’s leadership and it is a win for the hard work and efforts of our party workers,” BJP President said. The BJP, along with allies, has won 325 of UP’s 403 seats, leaving very few seats to be shared by all other parties. It has also swept Uttarakhand, adjacent to UP. Goa and Manipur, which saw direct contests between the Congress and BJP, have not given any party a majority and the BJP is in with a chance to form government with the support of others.